Have you voted yet in the Primary Election? The deadline to return your ballots is 8:00 p.m. on Tuesday, May 15 – less than a week away! Learn more about Oregon’s voting process and find a ballot drop box near you at www.oregonvotes.gov. Are you still making up your mind? Click here to read our list of endorsements. For a complete list of labor endorsements, check out the Northwest Labor Press’s list. One race to pay close attention to is the contest for Labor Commissioner, a non-partisan position. We, alongside nearly every union in the state, encourage voters to support Val Hoyle for this important position. 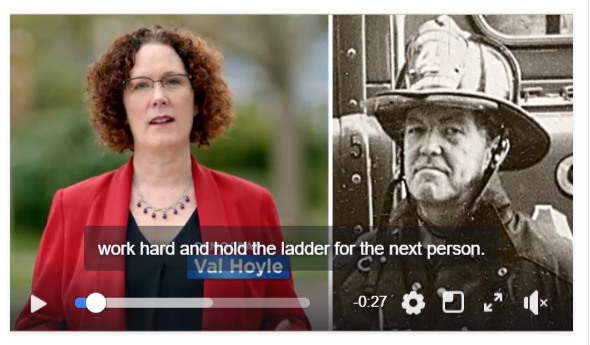 Val Hoyle is the only candidate in the race with the experience and history of advocating for working people needed to run the Bureau of Labor and Industries. Learn more about why we support Val Hoyle by visiting WorkingPeopleforValHoyle.com. Get involved: This weekend is our last shot to knock doors and win votes for Val Hoyle. Join us in Portland on May 12 and in Bend on May 12-13. Click here for information about Portland and click here for information about Bend. Workers at Volunteers of America Oregon have been organizing for two years and bargaining for over a year. These workers want a voice to advocate for their clients and themselves. However, VOA has spent thousands of dollars meant for client care on union busting attorneys to silence their voice. That means it is time for us to stand together, raise our voices and call on VOA to settle their contract. 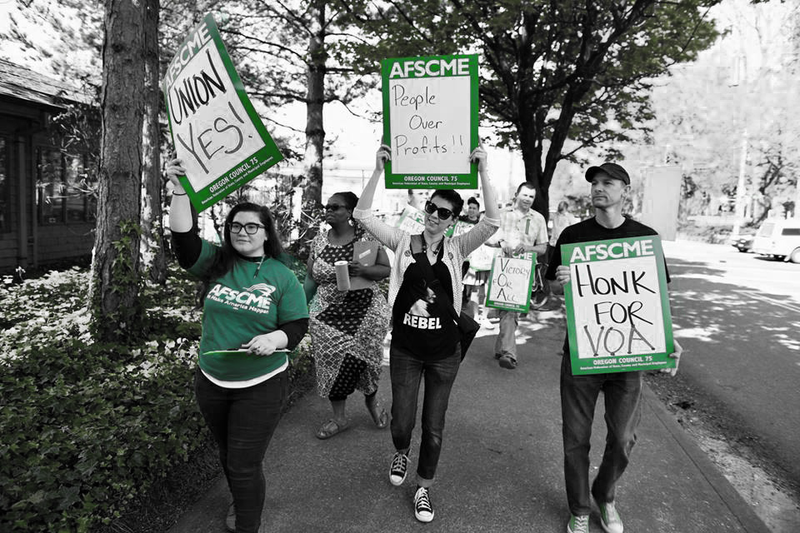 Join VOA workers on Monday, May 14th, at 11am in SE Portland for a rally as they fight for their first contract. Click here to RSVP & spread the word on Facebook. Can't make it on Monday? Sign the petition by clicking here. As the Trump Administration and majorities in Congress set their eyes on dismantling the federal government, their number one target is the Veterans Administration. Step one in the effort to privatize: bust federal unions. With money pouring in from the Koch brothers, and their front groups like "Concerned Veterans for America," nine million veterans who rely on the VA for their healthcare and their providers are fighting back against the privatization push! That's why unions, veterans’ groups and activists across the country are standing together to fight back. Please join us for an important forum and discussion on the efforts to Save the VA from privatization on Wednesday, May 16 at 6 p.m in Portland. When: Wednesday, May 16, 6:00- 7:30 p.m, Doors Open at 5:30 p.m.
Ai-jen Poo: Ai-jen Poo started organizing domestic workers in 1996 and helped found Domestic Workers United. In 2010, DWU was key in the passage of New York's Domestic Workers Bill of Rights, the first law in the country to guarantee domestic workers labor protections. The next year, DWU helped organize the first national meeting of domestic worker organizations, leading to the formation of the National Domestic Workers Alliance. She has been NDWA's director since 2010. Her other efforts on behalf of working people include Caring Across Generations, which campaigns for affordable health care for our aging population and for access to quality jobs for the caregiver workforce. Larry Itliong: Born in the Philippines, Larry Itliong was a farm worker in California. In 1956, he founded the Filipino Farm Labor Union and later organized a group of Filipinos to strike against grape growers in Delano. For eight days they were harassed and faced violence and saw no progress. Itliong approached César Chávez and the two groups joined together to launch the Delano Grape Strike of 1965 that eventually led to the creation of the United Farm Workers (UFW). Chávez became director and Itliong assistant director. He continued to organize with the UFW and the Filipino American Political Alliance until his passing in 1977. Maf Misbah Uddin: In 1988, Maf Misbah Uddin began work as an actuary in New York City. He became active in the Accountants, Statisticians and Actuaries Local 1407, becoming president in 2000. He also became treasurer of AFSCME District Council 37. As treasurer, he improved the transparency of the union's finances. His work was vital in keeping DC 37 on budget in the devastating aftermath of Superstorm Sandy in 2012, which did extensive damage to the union's headquarters. He is also founder and president of the Alliance of South Asian American Labor. May Chen: Before moving to New York in 1979, May Chen taught high school and college courses in California and founded a day care center. In New York, she did some work for UNITE HERE Local 6 of the Hotel, Restaurant, Club Employees and Bartenders Union. Inspired by the 1982 garment workers' strike in Chinatown, she joined the International Ladies' Garment Workers Union (ILGWU). There she worked on the Immigration Project, the first union-created legal advocacy department for immigrant workers. She later worked in ILGWU's education department and served the New York City Central Labor Council, the Coalition of Labor Union Women and the Asian Pacific American Labor Alliance, ILGWU Local 23-25, the New York Metropolitan Area Joint Board. Before retiring in 2009, she served as international vice president of UNITE HERE. Philip Vera Cruz: Born in the Philippines, Philip Vera Cruz worked on farms before moving to the United States. In 1943, he moved to California and became a farm worker. After joining the Agricultural Workers Organizing Committee, he was a key part of the strike of grape pickers in Delano, California, in 1965. He served as vice president of UFW until 1977. After that, he helped create the Farm Workers Credit Union and he created Agbayani Village, a retirement community for farm workers. Sue Ko Lee and the Dollar Store Strikers: Sue Ko Lee worked in the National Dollar Store's San Francisco factory in sweatshop conditions in the 1930s. ILGWU began organizing the Chinese Ladies Garment Workers Union Local 361, and it won a union election in 1938. The owner immediately sold the company to a new company headed by the factory manager and a former National Dollar Store employee in attempt to set aside the contract and break the union. Lee and her fellow workers went on strike and actively organized the strike, obtaining solidarity from their white co-workers. The unified front led to a contract that improved salaries, benefits and working conditions for the workers and helped break down racial barriers in San Francisco. Lee went on to become secretary of the union local and the San Francisco Joint Board. Velma Veloria: After graduating from San Francisco State University and working on anti-war and Filipino rights causes, Velma Veloria became an organizer for the Office and Professional Employees (OPEIU), ILWU Local 37 for cannery workers and SEIU. She fought for justice for Gene Viernes and Silme Domingo, ILWU local leaders who were assassinated in 1981. Later, she began working in support of political campaigns. Veloria used her experience to win a seat as a state legislator and pursued a variety of causes important to women and people of color. She organized numerous trade missions to Southeast Asia and helped strengthen relations between the United States and countries like Vietnam, the Philippines, Laos, Cambodia and Indonesia. 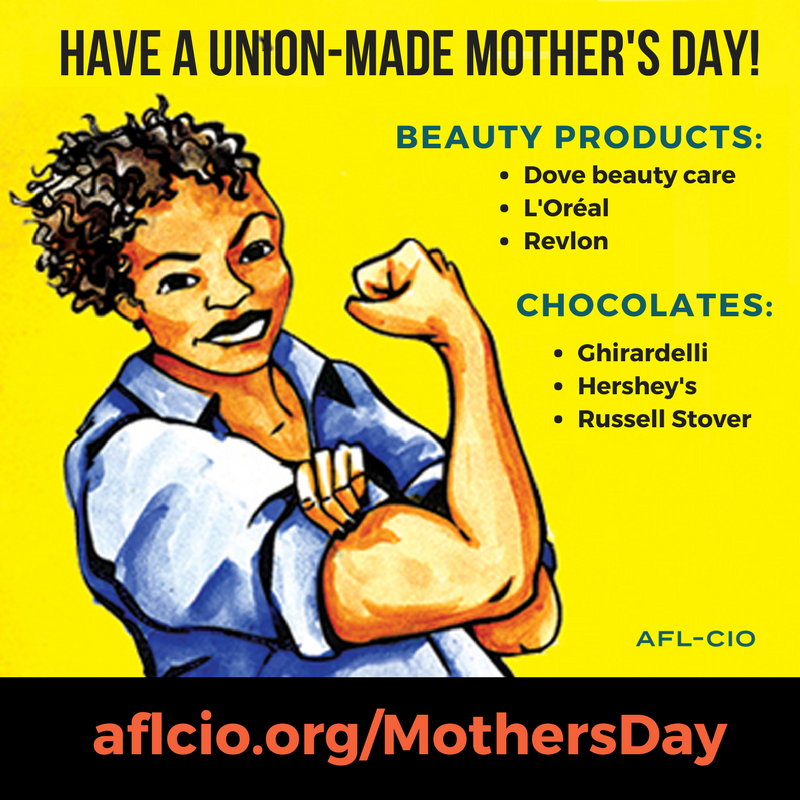 You have no excuse for waiting until the last minute to find a nice gift for Mother's Day that also carries the union label. Our friends at Labor 411, the union business directory from the Los Angeles County Federation of Labor, can help you out.